Our Maryland Global Leaders lecture series capitalizes on UMD's location neighboring Washington, DC to bring high-level diplomats, businesses, other international community leaders, and prominent visitors to College Park to share with the campus community their perspectives on vital global challenges and opportunities for international cooperation and global development. A joint effort with partners across campus, the series welcomes suggestions for potential speakers. Contact OIA Associate Director Joe Scholten. Please contact us, as well, whenever you are planning to invite a high-level diplomat to campus, for advice about protocol and just as a matter of institutional awareness. This lecture series extends and expands the previous Ambassadorial Lecture series that had brought to campus ambassadors from Afghanistan, Argentina, Austria, Bangladesh, Brazil, Cambodia, China, Colombia, Cyprus, Denmark, Egypt, France, Georgia, Germany, Greece, Hungary, India, Ireland, Israel, Japan, Liberia, Mexico, Norway, Portugal, Russia, South Africa, Spain, Thailand, Turkey, Uganda, Ukraine, and Vietnam. Not able to attend a Maryland Global Leaders event? No problem! Look below for photos and videos online. "Outlooks and Challenges for 2016" featuring Peruvian Ambassador Luis Miguel Castilla. "The Situation in Ukraine" featuring Olexander Motsyk, Ukrainian Ambassador to the United States. "Italy, Europe, and the U.S. Transatlantic Partnership: Shrinking the Atlantic in an Era of Globalization and Regionalization" featuring Italian Ambassador Claudio Bisogniero. “A Conversation with Ambassador Peter Bodde,” an alumnus of the University of Maryland, class of ‘76 and United States Ambassador to Nepal. “Rising Above: Preparing for Multiculturalism and the Global Community – The Peace Corps Experience” featuring Helen A. Lowman, Peace Corps associate director for volunteer recruitment and selection. This event was hosted by the Urban Studies and Planning Program, School of Architecture, Planning and Preservation, and co-sponsored by the UMD Career Center and The President’s Promise, and the Peace Corps. “El Salvador and the Economic, Political, and Social Impact of the Salvadoran Transnational Communities” featuring His Excellency Rúben Zamora, the Ambassador of El Salvador to the United States. “Regional Developments and their Impact on the Palestinian-Israeli Conflict” featuring Ambassador Maen Rashid Areikat, Chief Representative of the Palestine Liberation Organization (PLO) to the United States. The event was co-sponsored by the Center for International Development and Conflict Management, and the Joseph & Alma Gildenhorn Institute for Israel Studies. “Emerging Markets, the Pacific Alliance, and Chile” featuring Chilean Minister of Finance Dr. Felipe Larraín Bascuñán. 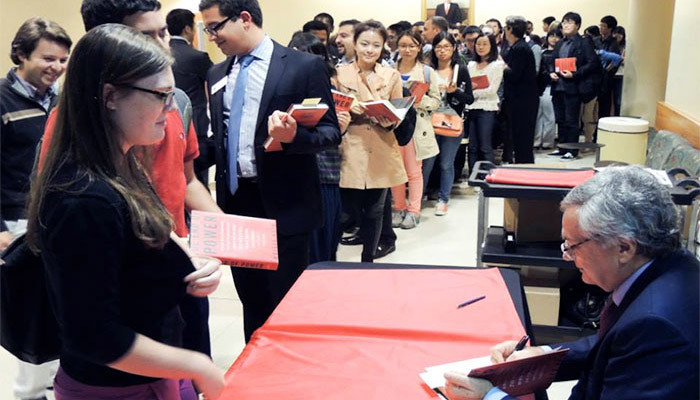 The event was co-sponsored by the Center for International and Security Studies at Maryland, the Center for International Business Education and Research, and the Department of Economics. "The End of Power: From Boardrooms to Battles and Churches to States, Why Being in Charge Isn’t What it Used to Be" featuring international writer, commentator, and former Foreign Affairs editor Dr. Moises Naim discussing his new book. The event was organized by the Center for International Business Education and Research. “Toward Economic Recovery: Ireland’s Story” featuring Irish Ambassador Michael Collins.